niche of Equine Practice all together in a gathering that celebrates HORSE and HUMAN. Now, I wasn’t quite conscious of the fact that this just might happen this year, but it DOES make sense. And…guess what? It’s happening! Each day just keeps bringing gifts for the symposium! This is going to be a WONDERFUL event! The presenters won’t just be presenting, they’ll be learning alongside you. The reason? The Symposium is not just an event, it’s a home. Come, join a number of these women in a gathering that is also a homecoming–for them, and for you. With Koelle Simpson, Linda Kohanov, Barbara Rector, Ann Alden, Shelley Rosenberg, Nancy Coyne, Linda-Ann Bowling, Tracy Weber, and others both on the presenter and attendee list who are pioneers in this field, this year’s Symposium is a gathering like no other! Linda’s return to Apache Springs Ranch, where she and others made Eponaquest into a training program that drew people from all over the globe to both experience and apprentice for equine work, will be a homecoming we will get to share with her. Linda is attending all 5 days, learning when she’s not presenting herself. 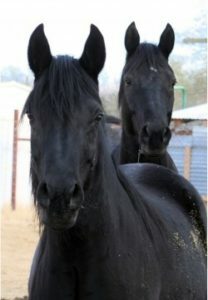 Linda’s two geldings Indigo and Orion, both sons of Midnight Merlin, will be coming with Linda, too! The geldings will be Linda’s co-facilitators in her demo and workshop. If you’ve not met these horses, this is the time to do it! 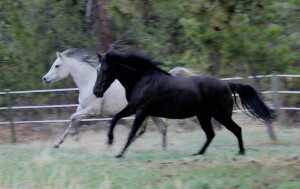 The qualities these horses share are the subject of years of study for Linda. “Indigo has shown himself to be capable of some amazing feats of energetic communication,” Linda says, adding that “the ability to project energy outward is one of the currently untapped gifts behind the high sensitivity/naturally dominant combination.” Come see how Linda works with these two to help facilitators and clients develop skills like emotional heroism. Three of my horses, who you may have heard stories about through the tele summit talks, will be coming! 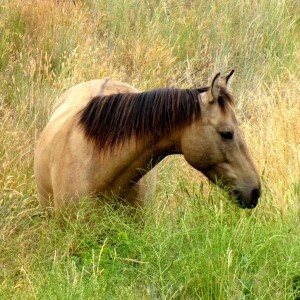 Cimma, the black mustang mare who I mention in a number of talks; Denny, my buckskin mustang gelding about who I also tell a story or two; and Arabian mare Firefly are coming. All are master healers and amazing beings. I can’t wait for you to meet them in your breakouts and throughout the symposium events! And the special things continue! 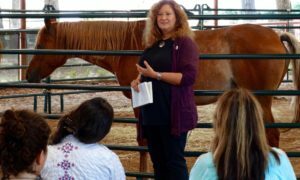 Koelle Simpson, who for much of her time in equine work for humans has remained outside the network of organizations and professional development circles, has decided to make the symposium her debut into these circles. Koelle will also be in attendance for the bulk of the Symposium, staying through Monday. This gives you opportunities to meet her as you attend events with her and her assistants, and learn about the trainings she runs at Apache Springs and other parts of the country. 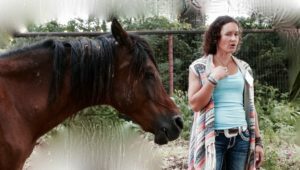 Koelle’s Keynote Address about how to build resiliency in times of chaos and stress, with horses as the link back to nature’s healing, will be well worth the listen in and of itself. Word has it she’s a wonderful speaker, and again, this is her first event in our industry! Then you ALSO get her demonstration of Equus Coaching approach just before lunch on Saturday. 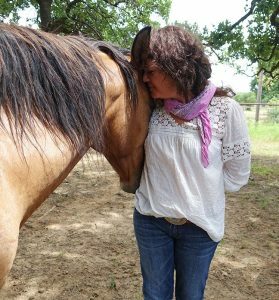 Linda’s Keynote about the archetypes horses represent will get us all thinking about the roles horses play, and what archetypal energies horses can draw from the Collective Unconscious for us to work with. Then we get her demo of the Eponaquest Approach the next day–a very popular part of last year’s conference that needed more time, and so this year has it! Linda’s post-conference workshop on emotional heroism draws on material from her last two books, and well as on her recent study and program development on the heroism involved in nonviolent leadership and culture change. This workshop is the debut of this material. 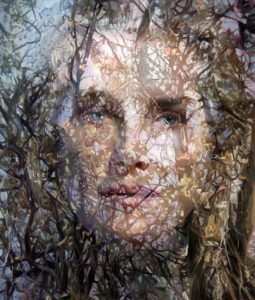 Jo Byrnes and Saan Ecker’s pre-conference workshop Thursday brings one of the most ground-breaking combinations together–that of horses and Constellations work. Constellations theory is both a radical step away from much mainstream therapy, and it’s a natural fit with what horses appear to be doing when a herd at liberty works with people. This workshop will change, and inform, everything you are doing. Jess Campmans’ pre-conference workshop will bring a new level of intuitive knowing, as well as energy healing so deep you forget what needed to be healed. 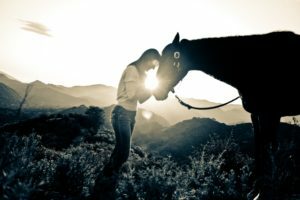 Spend time developing your intuitions, and gain insight on what you are called by Energy, Nature, Oneness to do and be in your soul work, as enhanced by horses. All that, and we haven’t even talked about the breakout sessions! There are 6 absolutely not-to-miss Breakout times, each with 4 concurrent sessions—the only complaint about which is—which one of all the powerful, invaluable concurrent sessions to go to! As if all the other events weren’t enough, you may find it’s these sessions that impact you the most. Well…but how to compare?! All that amazingness, AND I’ve worked hard to assure there are different ways to attend based on economic ability. 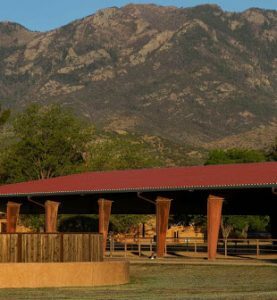 While much of the lodging is full, we’ve opened up the last house, a lovely casita, and so there is still limited availability to stay on site in Apache Springs with Linda, Koelle, and a number of the presenters. And while nearby accommodations in Sonoita and surrounding towns are filling, there are still AirBnBs available if you don’t mind the drive to and from the ranch. And there’s a small, and growing, number of people camping in the National Forest (no amenities, but if you know how to do it, a nice option) on the way in to Apache Springs Ranch, which is surrounded by Coronado National Forest. Information about the camping, or any option, is available by contacting Diedre. And if you REALLY want to come but can’t afford this, we’ve opened more positions in the Work-Study program! You can read about and apply HERE. The more people we get involved this way, the more we can spread out the responsibilities to assure your deep participation time. Don’t get me wrong, this is not a way to sneak in. There is important work, and we are seeking responsible self-starting, industrious people. But we want to make sure your role is as fun as it is vital! And we want to be sure EVERYONE who wants to attend can find a way if they have the work ethic and desire. You are all welco me, valued, home. Amazing community with which to build friendships and to network. Be part of something bigger than yourself, all-experiential, heart-and-soul powerful. The reviews from last year—virtually 100% of which were so enthusiastic and beyond positive, the most common comment were things like, “No Words,” “Amazing,” “Beyond description,” “mind-blowing”… Those kinds of things. This will be…so much more! Oh, and ONE more! Many are finding that, as strange luck would have it, airline flights are actually still extremely reasonable…in many locations, less expensive than earlier in the winter. Check your location and see before you assume it’s too late. And be sure to check both Tucson and Phoenix airports. You may notice that flights and car rentals are less expensive in Phoenix if you don’t mind driving a bit. Once you’ve registered, you can become part of the Facebook group where car shares and AirBnB and other lodging shares are announced. I am really excited about this year’s Symposium, and I know I’m not alone in that! There is still space, and this is a gathering where I hope, based on what you have heard, you will see there is a home being offered. A place where you can be seen, valued, connected, and where you can find your way to deepen your own journey with Horse. 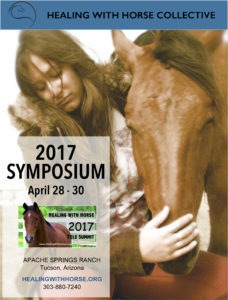 Please contact me if you have questions at (303) 880 – 7240 or at HealingWithHorse@ g mail.com. And don’t forget to check the Symposium page, the Meet the Presenters page, and the Testimonials page to learn more, then head on over to the Registration page to choose your way of attending! ⟵Life After the Tele Summit ~ And Before the Symposium!